With rates of overweight and obesity generally on the up, it’s perhaps no surprise that many of us will seek to lose weight at one time or another. My experience is that the great majority of people who want to lose weight will be able to, but the issue can be the sustainability of that weight loss. In short, many people lose weight only to regain it again, often with a bit of added weight on top. There are a number of reasons why conventional ‘dieting’ (using, say, a diet that is consciously restricted in calories and dietary fat) is unlikely to lead to lasting weight loss. One obvious issue is hunger. Consciously restricting calories will usually mean someone is hungrier than they would like, but weight loss seems to heighten this hunger, as evidenced by the fact that when individuals start to eat in a less restricted way, they can find themselves driven to eat larger quantities of food than they were eating before, at least until their weight ‘normalises’. Another fundamental issue concerns the metabolic rate. We expect this to decline as the body loses weight. However, there is evidence that metabolic rates tend to decline significantly more than would be expected as a result of weight loss alone. For example, in the first controlled trial of the effect of calorie restriction on weight (the Minnesota Experiment), while weights declined by 20-26 per cent, energy expenditure fell by almost 40 per cent. This dwindling of the metabolism can cause people to plateau at a weight significantly higher than the one they were aiming for, and may also contribute to weight going back on scarily quickly once ‘diet’ is relaxed. Without access to sophisticated testing equipment, it’s not possible to accurately gauge the impact of any diet on the metabolism. However, for those looking to lose weight in the long term, I generally advise people to avoid undue hunger. If we’re able to eat and live in a way that does not allow us to be unduly hungry then this suggests (though doesn’t prove) that the body is not being metabolically starved either. Some people wonder how it is possible to lose weight without hunger. Well, my experience tells me this is entirely possible with most people as long as they choose the right foods. In general terms, protein-rich are, calorie for calorie, more sating than carbohydrate rich ones. Carbohydrate-rich foods also have the added disadvantage of often destabilising blood sugar levels in a way which can drive hunger and food cravings. There is also a theory that lower carbohydrate diets allow more ready release of fat from fat cells which can then be metabolised. The idea here is that those on a low-carb diet may be able to supplement what they’re not eating with their own fat, and may be less hungry as a result. This fatty fuel, of course, may also help to maintain the metabolism (just like putting a bit more coal on a fire would). Recently, I came across a study which appears to support the idea that lower-carbohydrate diets are better for maintaining the metabolism than, say, low-fat ones, particularly in the context of weight loss . In this study, overweight or obese aged 18-40 were assessed for a range of body measurements including ‘resting energy expenditure’ (the amount of energy burned at rest over 24 hours) and ‘total energy expenditure’ (the total amount of energy burned over 24 hours). The participants were then put on a weight-reducing diet until they had lost 10-15 per cent of their weight over a 12-week period. Then, the study participants were monitored on the same diet but adjusted to ensure weight-stability rather than further weight loss. Body measurements, including resting energy expenditure and total energy expenditure were assessed at the end of each 4-week diet period. 21 participants completed the study. One of the major things this study tested was the effect of different diets on the metabolic rates of individuals assessed before any weight loss. In this context, diets that led to the smallest reductions in metabolic rate would be generally view as superior. Here’s the results from this experiment (REE = resting energy expenditure TEE = total energy expenditure). You can see from this that the decline in REE and TEE was smallest with the very low carb diet and was biggest for the low-fat diet. The results were statistically significant. However, not all the news was good about the very low carbohydrate diet, as it induced the highest levels of cortisol (a key stress hormone) and the inflammatory marker CRP (C-reactive protein). Against this, though, it perhaps considering that carbohydrate controlled diets have been shown to bring positive changes in a range of markers for chronic disease including improved blood sugar control, lower blood pressure, higher levels of ‘good’ (HDL) cholesterol and lower levels of blood fats known as triglycerides. The reasons for the differences in resting energy expenditure and total energy expenditure are not easily explained. Factors such as physical activity, the thermogenic effect of food (the increase in energy expenditure arising from digestive and metabolic processes) and changes in the thyroid hormone T3 did not appear to provide the answer. One potential explanation mooted by the authors concerns the hormone leptin. Leptin is secreted by fat cells and acts in the brain to quell appetite but also stimulate the metabolism. 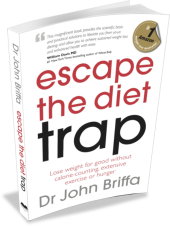 Leptin insensitivity (a failure of leptin to act efficiently) has been suggested to be a potential underlying mechanism in overweight and obesity (something that I explore in Escape the Diet Trap). One way of gauging leptin sensitivity is be dividing energy expenditure by the level of leptin. The higher this number, the better leptin sensitivity is believed to be. In this study, the very low-carb diet produced the best leptin sensitivity, with the low-fat diet producing the worst. 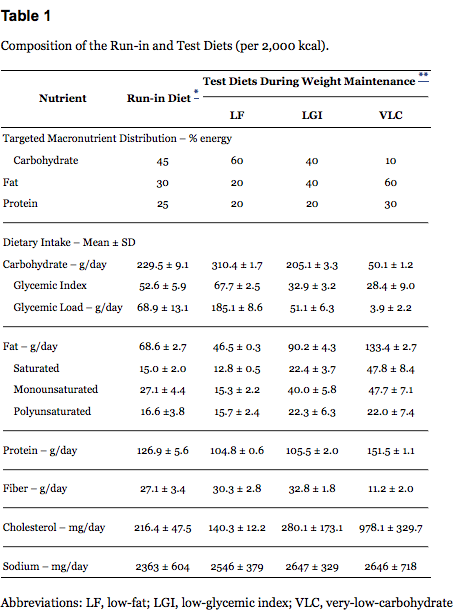 This was a relatively small study and the test diets were relatively brief (4 weeks) in duration so we should perhaps not draw too many conclusions from it. However, there is some evidence here that diet lower in carbohydrate and richer in protein and fat may offer benefits over the long term for weight loss maintenance on account of their ability to help maintain the metabolism. Another thing worth bearing in mind is that in this study, individuals were asked to eat calorie-counted quantities of food each day. In the real World, though, what makes a new way of eating easier and more sustainable is if it allows individuals to lose weight and maintain their weight loss without hunger and the need to consciously control how much they eat. As a general rule, as I alluded to above, here again diets relatively rich in fat and protein tend to win out over those based on carbohydrate. Do low-carb diets really make people sleepy? Fantastic write up! My take away despite the limitations of the study is that this is more support for the benefits of low carb way of eating!! I adopted a carb restricted / high fat & protein diet in January 2013 after reading various books on the subject including ones by Taubes, Groves, Phinney, Stevens and Volek (before finding this site!). I’m a competitive rower and train 5 times per week including gym sessions. People never described me as fat but I began to feel uncomfortable when I hit about 16.25 stone. I’m 6ft 2inches. I adopted eating lots of eggs (up to 10 a day) most often fried in coconut or olive oil, lots of cheese, fatty meat, nuts etc as recommended by the various authors. I made my own blue cheese and olive oil dressing just to consume even more good fats with greens. I substituted milk for Kefir (home made) and if I really fancy some fresh milk drink (yes drink) fresh cream! I snack on nuts (usually walnuts or brazil) and the shocking calorific fact is that I can easily consume 600-700 calories in a “snacking session”. I generally don’t feel hungry though. I don’t consume any vegetable oils or margarine anymore. My results: a weight loss of about 1.5 stone which has now stabilised. However, it’s not so much the weight loss but my body shape change which is the most amazing. And it’s continuing to change despite the weight staying pretty much the same +/- 0.25 stones). I’m just as broad (actually bigger across the shoulders and chest) but I’ve lost about 3-4 inches from my waist. And even though my weight has stabilised, I can feel that I’m still losing size from my waist / hip area. Trousers and belts don’t lie! People have remarked that they’ve never seen me in better shape. My stomach is completely flat and a 6 pack beginning to emerge with love handles vanishing. My strength has increased by between 20-50% which is amazing! I’m not hung up on losing weight per se anymore, as I can see my muscle size increasing and my fat stores decreasing. My subjective interpretation of these results: increase in lean body mass and substantial reduction in body (particularly visceral) fat. When people ask me what I’ve done to get such a dramatic change, I’ve stopped telling them! Very few people believe me! When I say I now eat lots of fat, meat, eggs etc (the fattier the better) but no “healthy whole grains” or low fat anything, no margarine and carbs less than 50g or so a day they think I’m mad. I’ve had “discussions” with medical professionals and they’ve told me it doesn’t make sense! I bought a ketone meter and test strips to try and attain nutritional ketosis and must admit that this for me is difficult. I put it down to having a diet too high in protein. I may revisit that aspect one day but don’t think being in nutritional ketosis is necessary for a carb restricted diet to work, particularly if you’re wanting to increase muscle mass. I’m going to get my blood lipids checked in the next couple of weeks (and I’m consuming even more fat just for the fun of it in the meantime! ) to see if they’re as healthy as the various authors say they should be. I can easily see myself continuing this lifestyle diet because it works and isn’t difficult. I have been following a low carb diet for three weeks and am thrilled to be losing weight consistently but having excellent food at the same time. 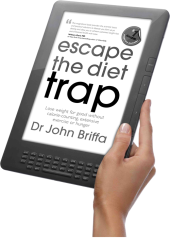 I came across this diet through The Low Carb Gourmet book which has such different and delicious recipes. Am quite prepared to put in the time to get to eat Courgette Cake, which sounds odd but is really wonderful and has cream cheese frosting. 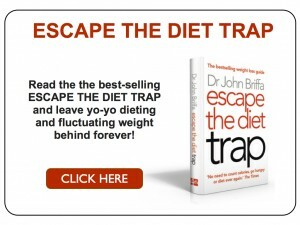 Even as I type this I realise it seems bizarre but it really works – and with all the foods I like so much. I can see me following this as a way of life. I adopted a lowcarb diet exactly one year ago after trainingt Crossfit 2-3 times a week for 8 months prior to that without seeing any weightloss result (most likely due to my increased hunger from the vigorous workouts). After just 12 days on lowcarb I started to see amazing results, and after two months I was so lean that my family started to beg me not to lose anymore weight. However, the lowcarb diet became an obsession to me and I started to go VERY lowcarb which was a very bad idea. I ended up in hospital with low T3 and high cortisol, unable to get proper sleep and unable to keep my balance (dizzy, fatigued). Only months later did I learn that I needed to add a minimal amount of safe starches to my diet (primarily from sweet potatoes and occasionally white potatoes) in order to feel better. However, I continue to suffer from sleep deprivation and having to take 2MG of melatonine when I get too stressed. I’m not sure what I can do to improve my sleep, I have blackout curtains, sleeping in a pitch black room, I dim the lights after 8PM and try to wind down as much as possible but it doesn’t seem to help. My blood panel says nothing except a small tendency to anemia. Anders : You can see from your health that what you have been doing is not good for you. Carbs are not poison. If you are still not sleeping or have other health problems using this diet then you need to think again if it is right for you. Weight loss is not the only thing that is important for health. There are three macro food groups. Without components of two of those food groups in your diet you would die. The carbohydrate food group isn’t one of those two, ie you don’t need it to survive or thrive! It seems highly unlikely the symptoms you describe could be attributed to carb restriction. An excellent book: The Art and Science of Low Carbohydrate Performance by Jeff S. Volek PhD RD & Stephen D. Phinney MD PhD is worth a read for any athlete (particularly longer duration events) wanting to potentially boost their performance by carbohydrate restriction. I’m likely to be controversial here, but my (limited) research would lead me to conclude that consumed regularly and over the longer term, certain carbohydrates eg refined sugars, corn syrup and even modern wheat etc (all considered “normal” foods) could be classed as poison, particularly in those individuals who are sensitive to their effects (probably about 75% of us). The rise in obesity, type 2 diabetes etc would appear to support this. Poison: n. A substance that causes injury, illness, or death, especially by chemical means. A low carb diet is the ONLY way I have ever lost weight and kept it off. I lost 3 stones over the past year, nice and steadily and consistently and half by doing Atkins and I maintain it to within 2 pounds at all times. In the past I did the old calorie counting thing, lost a few pounds only to get bored and regain them with more added. Low-carb is great, just eat lots of proteins and natural fats along with green veg and only a little fruit. It works! It works long term. It controls diabetes, it makes you feel great. I do not miss sweet things or carbs at all, neither do I have any cravings. I will never ever go back to the way I was. I love this well-being and being normal weight for my height. I feel very passionately that it is carbs that cause and maintain obesity. Nobody is going to get fat eating meat, fish, eggs, butter, cream etc. It is your grains, starches and sugars that are doing it. It is so obvious, why are the ‘experts’ not seeing it? Why do they not see that their ‘low fat, plenty of wholegrains’ approach has caused the biggest crisis of obesity in history? I despair when I see what foods are being pushed in the supermarket. What hope is there when you can get a dozen doughnuts for a quid? We are offered slabs of cut price chocolate when we buy stationery in WH Smiths, sugary fizzy pop is offered at the petrol station. It really does feel like sugar is a drug that is being peddled. Indeed Mark – carbs are not actually even necessary at all for the body! Yet without proteins and fats we die. That is why peoples like the Eskimos can live on seal meat alone – they traditionally did not eat carbs and were fine. People think things like bread are vital for life, they are not. Your strict requirement for carb is zero. The body can convert proteins and fats for energy, ketosis is a natural thing. I love being in ketosis during the hours that I fast between meals – I do not snack at all. I don’t eat breakfast deliberately because it is the most unnecessary and destructive meal of the day in my view. I have only lunch and dinner every day. People eat too much, too frequently, they stimulate insulin production over and over again until they succumb to diabetes – that is what happened to me. I am a type 2 but totally controlled by diet alone. I wish people could see that with discipline they can control it very very effectively as I do – no need for medications. delicious to eat low carb! I love it so much and like you I eat as much fat and protein as I wish. I have not counted a single calorie, they are irrelevant. People do not believe me yet they see me in a size 12 dress while they are sitting there in a size 20 and STILL maintaining that calorie counting and low fat is the way to go! Brainwashed you see. In my life I have never enjoyed food more. Low grade sugary rubbish does not interest me. Densely nutritious food is the only way to feed your body properly. I used to be so hungry on a high carb diet, I ate every couple of hours. Now I can fast for hours if need between meals as I do not feel that desperate type of hunger any more. There was a big discussion on BBC radio this morning about Type 2 Diabetes with a professor from Cardiff University saying “we’re a nation of lazy porkers…” There’s no doubting we have a real problem with sugar addiction in the UK and the food manufacturers and supermarkets know how to push our buttons. Only today Kelloggs announced they were reducing the amount of saturated fat in Special K by 40%. The amount of sugar will remain the same. I find the fact that they’re preying on people’s ignorance disgusting, because at the other end we’re funding their inevitable illness and the ever increasing burden on the National Health Service. Why should supermarkets and their ilk make £billions of profit without a single drop of responsibility? Hi Muni, not sure I’d entirely agree with you about what you say about breakfast but whatever works for you! And congratulations on your victory over your diabetes meds! I too don’t understand the attitudes of the majority of medical professionals with regards to diabetes control and their insistence on the low fat / high carb regime. Not just for diabetes control of course but as the regime necessary for a “healthy” lifestyle. The food pyramid seems to be on its head, as does government advice! Maybe it’s because doctors, nutritionists etc can’t be disciplined for following whatever the NICE guidelines say. What I don’t understand is that the guidelines are supposed to be “evidence based”. 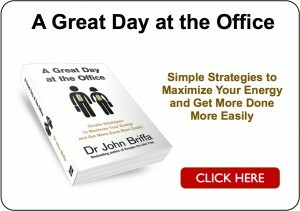 Dr Biffa maybe your comments…?! Could the increases in cortisol and CRP be down to the stress of the dietary change i.e. the ‘low carb flu’? Or is this seen in other studies to be a longer term phenomenon? I too am horrified at the continued insistence that the wholegrain low fat lifestyle is a healthy one. We can only assume that like the big pharmaceutical companies the food industry has everyone in their pockets. The whole type 2 diabetes epidemic and the lack of information people get about making the evidence based choices around food and perhaps avoiding medication really distresses me. Enlightened Medical Professionals are promoting a low carb high fat diet, as a healthier option to the standard dietary advice from the NHS, ADA, BDA and DUK etc. especially for the control of obesity and its often linked type two diabetes. The $64000 question has to be are they wrong ? As many know, whatever success lowcarbers post up on forums and blogs, whether diabetic or not, is usually dismissed by most medical professions as anecdotal (subjective unreliable untrustworthy sketchy) the mainstream medical profession like to deal in facts. So, let’s look at some facts. Conclusions: A meta-analysis of prospective epidemiologic studies showed that there is no significant evidence for concluding that dietary saturated fat is associated with an increased risk of CHD or CVD. As for carbs being essential. is it normal for my blood glucose to rise to 150 after a meal only of protein, fat and veggies? I’m not eating VLC, but I use coconut oil. I eat veggies, one/two servings of fruit and one sweet potato. Should I be concerned? Why does this happen? I though this “physiological insulin resistance” only happened to those who do VLC and have high fasting blood sugar. My fasting blood sugar is always 70. Sweet potato is as much of a vegetable as a white potato. The meal you described consistsed of fat, protein and close to 100 grams carbohydrates (if there are two fruits), that is why your BS is rising to 150. I didn’t express myself well, I’m sorry. On that meal I ate only protein, fat and veggies. It was dinner. During the whole day for the carb intake I ate some sweet potato and two pieces of fruit. I said that to meant that I was not eating VLC. It is very strange then.